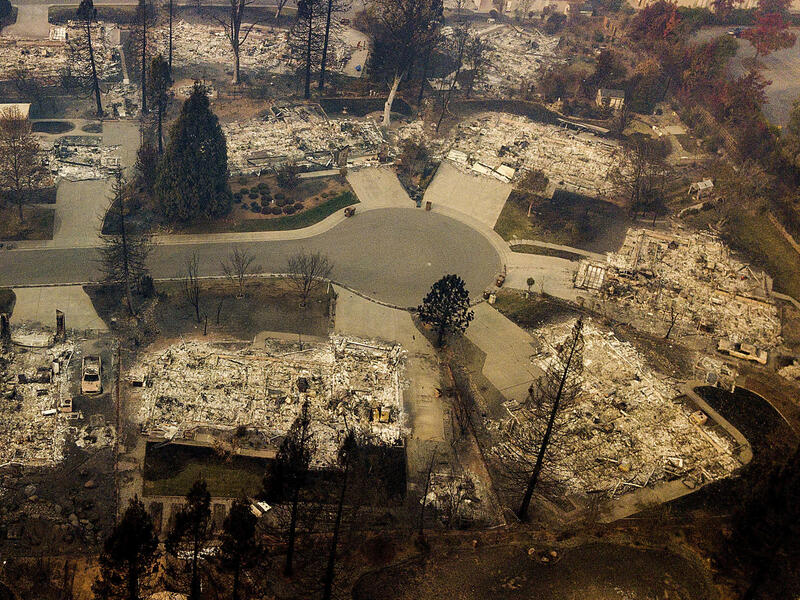 Residences leveled by the Camp Fire line a cul-de-sac in Paradise, Calif., earlier this month. A massive federal report says climate change is contributing to larger wildfires as well as other deadly extreme weather. 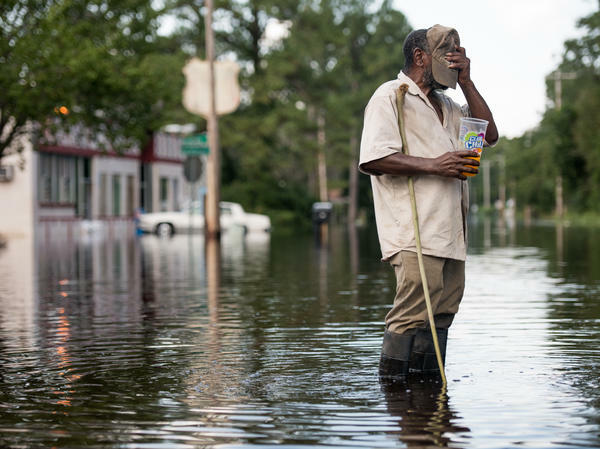 Larry Hickman stands in floodwaters caused by Hurricane Florence in September in Bucksport, S.C.
"Climate change is already affecting every part of the United States, almost every sector of the United States, be it agriculture or forestry or energy, tourism," says George Mason University professor Andrew Light, who is one of the report's editors. "It's going to hurt cities, it's going to hurt people in the countryside, and, as the world continues to warm, things are going to get worse." President Trump, numerous Cabinet members and some members of Congress have questioned whether climate change is caused by humans or whether it is happening at all. "I don't think there's a hoax. I do think there's probably a difference. But I don't know that it's man-made," the president said on CBS' 60 Minutes in October. In an August interview about deadly wildfires in California, Interior Secretary Ryan Zinke told television station KCRA Sacramento: "This has nothing to do with climate change. This has to do with active forest management." The new report, mandated by Congress and published by the U.S. Global Change Research Program, is the latest and most detailed confirmation that humans are driving climate change and that Americans are already adapting to and suffering from its effects. Climate change is "an immediate threat, not a far-off possibility," it says. For example, large wildfires are getting more frequent because of climate change. The report notes that the area burned in wildfires nationwide each year has increased over the past 20 years, and "although projections vary by state and ecoregion, on average, the annual area burned by lightning-ignited wildfire is expected to increase by at least 30 percent by 2060." And the authors make clear that more extreme rainfall and flooding is widespread, going beyond major hurricanes. In the Midwest, runoff from heavy rains have depleted some cropland of nutrients. In the Northeast, towns are dealing with catastrophic flooding from summer thunderstorms. "If you look at the whole U.S., the amount of precipitation overall may be less, but it's delivered in these very intense precipitation events," explains Brenda Ekwurzel, an author of the report and senior climate scientist at the Union of Concerned Scientists. "That's how you get a lot of flash flooding, especially after a wildfire." In the Southwest, climate change is driving a particularly devious phenomenon: climate change is contributing to drought and flooding in the same place. Drought takes hold for months. When rain does fall, it's increasingly likely to come as an extreme rainstorm, which causes flash flooding and landslides. Scientists predict that dynamic will only get worse as climate change progresses. "Unless counteracting efforts to improve air quality are implemented, climate change will worsen existing air pollution levels. This worsened air pollution would increase the incidence of adverse respiratory and cardiovascular health effects, including premature death." The authors warn that those who are most economically and physically vulnerable will continue to be most severely impacted by climate change, whether it's air pollution, disease, floods or fire disasters. "The real leading edge of action in the United States, now, to deal with climate change is at the non-federal level," says Light, who also serves as a senior fellow at the World Resources Institute think tank. "It's states, it's cities, it's businesses." "Successful adaptation has been hindered by the assumption that climate conditions are and will be similar to those in the past," the authors write, arguing that acknowledging climate change, adapting to its effects and working to limit global warming, while expensive, will save money and lives in the long term. "We're putting a cost on inaction," explains Ekwurzel, referring to future global inaction to significantly reduce greenhouse gas emissions and adapt to the effects of climate change. "There's some really heavy duty news in here. I mean, we're talking billions of dollars as the cost of inaction each year. I think a lot of people in the U.S. will be surprised by that." A giant new government report says climate change is already hurting communities in the U.S. It was supposed to be published in December. The White House instead chose to publish it today, Black Friday, despite opposition from many scientists. In a few minutes, we'll hear from one of the scientists who contributed to the report. First, NPR's Rebecca Hersher explains wildfires, floods, droughts and air pollution are all worse because of global warming. And yet, scientists say there's hope. REBECCA HERSHER, BYLINE: The story of this climate change report actually starts almost 30 years ago. UNIDENTIFIED PERSON #1: This White House conference on global climate change was expected to begin about 15 minutes ago. HERSHER: It's halfway through the first Bush administration. UNIDENTIFIED PERSON #2: George Bush, president of the United States. HERSHER: When Bush takes the stage here, it's April, and the White House is feeling the heat, so to speak, on global warming. A United Nations panel had just published its first report ever saying that humans are causing global warming. And it seemed to demand action of some kind. GEORGE H W BUSH: And that's why I've asked Congress - our Congress - to approve a 60 percent increase in our budget for the Global Change Research Program. HERSHER: And a few months later, Bush signs a law that requires that research program to publish national climate assessments every four years. They have to explain the latest science and, equally important, lay out the effects of climate change in the U.S. in a way that's accessible, easy to understand. That's what this new report is - the fourth National Climate Assessment. Andrew Light is one of the editors, and he says it's a big deal. ANDREW LIGHT: This is the most comprehensive report that any single country has done on future impacts of climate change. HERSHER: The big takeaway is that climate change is already hurting Americans - has been for a long time. LIGHT: The thing that everyone is thinking about right now obviously is forest fires. HERSHER: The report says that megafires are getting more frequent in part because of climate change. The number of acres burned each year in the U.S. has increased in the last two decades and will continue to go up as it gets hotter - plus other extreme weather, more intense hurricanes, longer droughts, more extreme rain, rising sea levels, more air pollution. There is some good news. Parts of the U.S. are already doing things to mitigate and adapt to climate change - trying to reduce emissions, conserve water, change farming practices, elevate buildings. LIGHT: The real leading edge of action in the United States now to deal with climate change is at the non-federal level. It's states. It's cities. It's businesses. HERSHER: He says non-federal because the Trump administration has systematically started reversing climate change policies - fuel standards for cars and trucks, emissions from power plants, U.S. membership in the Paris climate accord. But their report has one other hopeful tidbit. It's late, but it's not too late to limit the effects of climate change. Light says he hopes the national climate assessment will be a wake-up call for Americans regardless of politics. LIGHT: It's no longer the case that we sort of think about this as impacts that are far off in the future. It might be your grandkids or your great-grandkids that you may or may not meet someday that are - you've got to worry about. You've got to worry about yourself. You've got to worry about your family right now right in front of you. HERSHER: Rebecca Hersher, NPR News. Transcript provided by NPR, Copyright NPR.